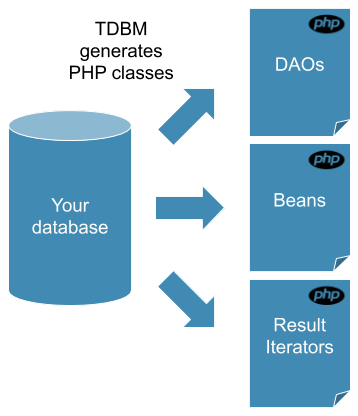 THE DATABASE MACHINE (TDBM) is a PHP library designed to ease your access to your database. The goal behind TDBM is to make database access as easy as possible. Users should access their objects easily, and store those objects as easily. TDBM is an opiniated ORM. It will not suit everybody and all needs. Here is what you need to know. TDBM is a "database first" ORM. Everything starts from your database. TDBM is very good at understanding your database model and the intent behind it. It will generate PHP objects mapping your model. and Beans that are classes representing a row in your database. Because PHP objects are generated (no magic properties), you get a nice autocompletion in your favorite IDE (PHPStorm, Eclipse PDT, Netbeans...). TDBM has one of the most powerful database model analyzer out there. TDBM analyzes your foreign key and turns them into getters and setters. TDBM can automatically detect association tables to generate many to many relationships. ... and turn it into real OO inheritance! TDBM is meant to be easy to use and non obtrusive. Making simple tasks should be simple. TDBM does not cover everything you can do with a complete ORM system. But it makes as simple as possible those tasks you do 80% of the time. For the remaining 20% (like performance critical requests, and so on), you can use SQL. For instance, TDBM has a unique feature that guesses jointures for you. No need to write joins anymore! TDBM uses the hugely popular Doctrine database abstraction layer for low level database access. It allows compatibility with a very wide range of databases. There is no configuration needed for TDBM. TDBM needs a DBAL database connection and a Doctrine cache. That's it! Ready to dive in? Let's get started! TDBM is framework agnostic so can be used in any PHP application, but also comes with installation packages for the most popular PHP frameworks out there.